One out of every six Ohioans relies on help from the federal government to buy groceries for themselves or their families each month through the Supplemental Nutrition Assistance Program (SNAP, formerly “food stamps”). In Cuyahoga County, that number is one in five. And even in Geauga County – the county with the lowest poverty rate and highest median household income in the state –more than 3,000 residents are SNAP recipients. Children under 18 live in half of SNAP households in Ohio; a person with a disability lives in half of the households as well; and at least one person age 60 or older lives in nearly a third of households that receive SNAP. Like other safety net programs, SNAP touches every corner of the state – urban, rural and everywhere in between. It is widely regarded as one of the country’s most effective anti-poverty programs, and has been credited with nearly eradicating starvation and malnutrition as a public health issue in America since the federal government first began providing nutrition assistance in the late 1960s. It is therefore difficult to imagine what would happen if Ohio suddenly stopped receiving the monthly $200 million in SNAP benefits paid by the U.S. Department of Agriculture (USDA). Perhaps the only certainty is that around 1.4 million Ohioans would have to reduce their grocery budgets by an average of $122 a month. Although this worst-case scenario has not yet materialized, the partial government shutdown is beginning to raise alarm among low-income families and community groups. Last week, the first disruptions to regular SNAP payments began as the USDA issued early benefits to cover the month of February. The USDA, one of nine federal agencies affected by the partial shutdown, was able to make this advance payment only because the Continuing Resolution (CR) that funded the agency until December 21, 2018 allowed for already-obligated payments to be made up until 30 days after the CR’s expiration. By disbursing approximately $4.8 billion for February’s SNAP benefits by the January 20 deadline, the Trump administration managed to avoid the possibility of running out of contingency funds mid-February should the shutdown not be resolved. Though the advance SNAP payment is a necessary emergency action given the circumstances, it creates a disruption for low-income families who may now face confusion over how to budget for groceries over the next six weeks. When the Ohio Department of Job and Family Services (ODJFS) issued February’s benefits on January 16, the agency emphasized that the payment was not a bonus and is meant to cover next month’s food. ODJFS further instructed SNAP recipients to “plan accordingly and make any food assistance they receive in January stretch as long as possible.” But just how long these advance benefits will have to stretch remains uncertain for SNAP recipients, given that social service organizations like the Greater Cleveland Food Bank are already warning their clients that SNAP benefits are not guaranteed for March if the shutdown continues. While these warnings from food banks and ODJFS are clear, SNAP recipients can be a hard-to-reach population, particularly if they lack a permanent address or reliable internet access. The government shutdown is likely omnipresent news for those reading this blog; but those struggling to make ends meet may have more pressing priorities than keeping up with the news coming from Washington each day. Absent time for ODJFS and human service providers to prepare any meaningful outreach effort, it is unclear how many SNAP recipients will receive the instruction that the current balances on their accounts are meant to last the next six weeks or longer. Such extreme consequences also necessitate that Ohio policymakers develop a contingency plan to ensure no Ohioan goes hungry come March. Allowing food stamp benefits to go unpaid would bear human, economic and political costs. And although we are still several weeks away from knowing how realistic this unprecedented threat is, the current government shutdown is already the longest in history, with no resolution yet in sight. While Ohio’s food banks and pantries will continue to be a vital resource for those in need of emergency food, the capacities of these charitable organizations would be severely stretched in the absence of SNAP. The Ohio Association of Foodbanks estimates that SNAP provides 12 meals for every one meal provided by Ohio’s food banks. 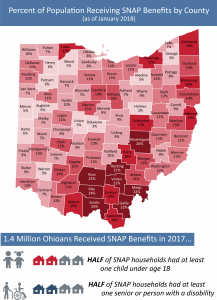 SNAP is also an important economic stimulus, pumping around $200 million into Ohio’s food retailers each month and freeing low-income Ohioans to spend their limited resources on other goods and services. Other USDA-funded nutrition programs, like the Special Supplemental Nutrition Program for Women, Infants and Children (WIC) add to these totals and would also be in jeopardy if the shutdown lasts through February. If the shutdown is not resolved by March, the USDA has said it has a $3 billion emergency fund that could be used to cover SNAP benefits, but this amount is estimated to account for less than two-thirds of a typical month’s benefits, nationwide. Some legal experts have argued that SNAP’s authorizing law implies food benefits are akin to an entitlement program, similar to Medicaid and Social Security, thereby obligating the USDA to continue paying benefits even during a shutdown. This legal argument remains untested, and it is unclear whether the USDA would be open to adopting such an interpretation. Absent a resolution, it is likely that the state will be called upon by advocates to step in and fill the funding gap using reserve funds or other revenue streams. Given the extremity of the consequences, it is reasonable to expect that Congress and the Trump administration will continue working to prevent the worst-case outcome from being realized. But such extreme consequences also necessitate that Ohio policymakers develop a contingency plan to ensure no Ohioan goes hungry come March. 2013-2017 American Community Survey 5-Year Estimates. Food Stamps/Supplemental Nutrition Assistance Program (SNAP).